When I was a landscape design student in Sweden, I remember the reaction my classmates had during my presentation about the internship I’d done back home in North Carolina. “What is that brown stuff everywhere?” they asked. It was mulch. The concept of it was so bizarre to them that the subject dominated the question and answer part of my presentation. Why were there not more plants? What was the reasoning behind using mulch versus groundcovers? What they saw was a type of landscape design foreign to them. As a designer, I’ve never really come to grips with this. I miss the lushness of the Swedish landscape. Green dominates every inch of soil in the short summers there. Our climate and soil in North Carolina are very different from Northern Europe, but I think groundcovers are missing in the majority of our yards. They are not just weed control and erosion control, but they offer beauty and ecological service to wildlife in residential areas. It’s a passionate area of interest I’m constantly researching and learning more about every day. How much money are you spending on mulch every year? Some mulch will always be necessary, but we can reduce our annual mulch expenses by planting more groundcovers. In rethinking our landscapes to include more plants, we can still create low maintenance landscape beds that suppress weeds and prevent erosion, but with a smaller ecological footprint and lower annual expenses. We’ll make our landscapes healthier in the long run. Some might even say more beautiful. In nature, the groundcover layer occupies about 50 percent of the plant community. These are plants that have evolved to be extremely competitive; their purpose is to cover the ground in and around other species they must share water and resources with. The ecological service they provide is vital, but they can also be thugs. When too dominant, they form monocultures through which nothing can compete. Ivy smothers the ground layer, and crawls into trees and slowly kills them. It isn’t just about the light, or the soil that causes the issue: plants also need to be selected for how aggressive they are in comparison to their neighbors. We spend a lot of time matching plants by color, texture, and form, but not enough by competitiveness. Aggressive plants are not always bad, as long as they are not invasive and as long as proper controls are in place to prevent them from becoming thugs in the garden. We should be using highly competitive plants in combination with equally competitive plants so they battle it out and find equilibrium. This is the most natural approach, similar to how the wild groundcovers and taller plants usually occupy the same space in competition with each other. Look at our native creeping phlox (Phlox stolonifera), and foamflower (Tiarella cordifolia). 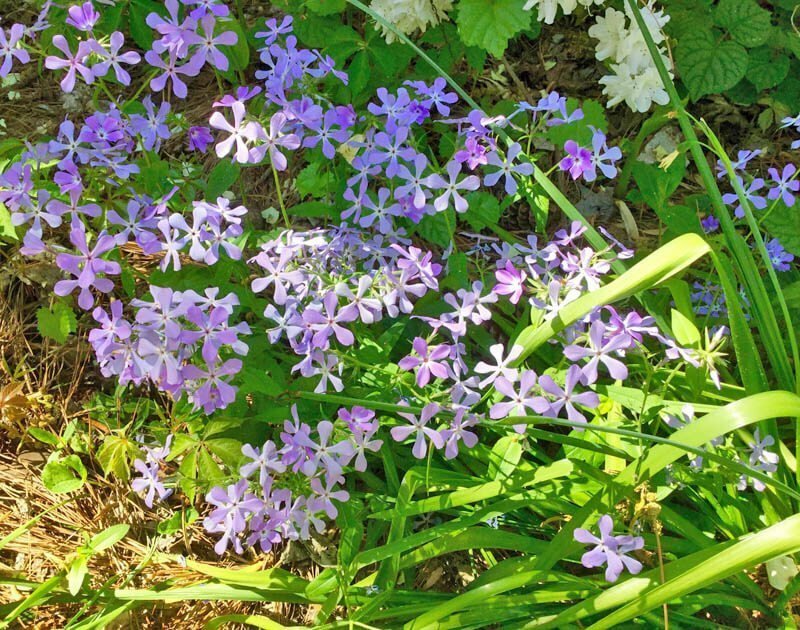 Both are native, neither are invasive, but the phlox would overcome the foamflower because it spreads quickly by rhizomes while foamflower is slow growing and clump forming. The phlox would be a better match with groundsel (Packera aurea), another fast spreading native that the phlox would form a mat around and compete with. If you have a small space, you can also consider controlling dominate groundcovers with physical barriers. Edging that is inserted into the ground deeper than the plant’s root system can effectively keep them contained. Just make sure you research how deep the edging needs to be for the plant you want to use. Slow growing groundcovers might need extra help spreading. You will want to mulch around your newly planted groundcovers to continue to suppress weeds while they spread to maturity, but use a thin layer of one inch instead of the usual three inches you might put around trees and shrubs. Too much mulch will suppress the groundcover’s growth. Recycled leaf litter is preferred as it breaks down easier than hardwood and allows groundcover to spread over it easier. Balance is key for successful groundcovers in the home landscape. 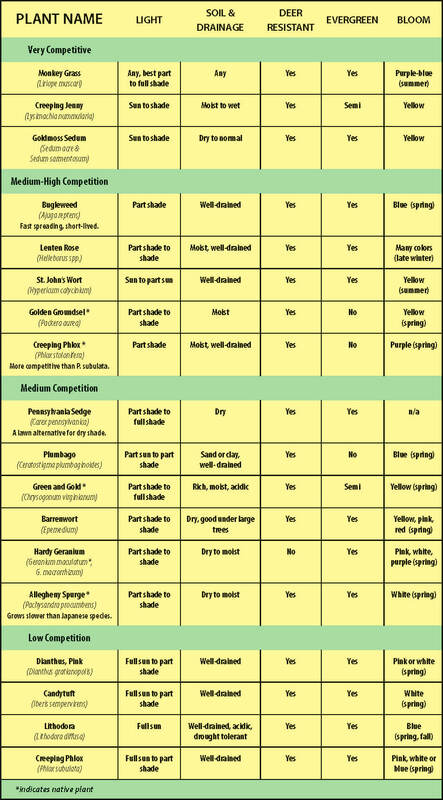 The attached groundcovers chart is organized by aggressiveness and how fast the plant spreads. Other notable qualities are deer resistance, evergreen, and significant bloom. This list is only partial with a mix of more common cultivated garden plants that may be of interest. If you have any questions about a plant not listed, feel free to email me.